A service can be something as simple as preparing and delivering a meal to a table in a restaurant or as complex as managing the components of a data center or the operations of a factory. We’re entering an era in which everything is a service. A service is a way of delivering value to a customer by facilitating the expected outcome. That definition sounds simple enough, but it can be rather complicated when you look deeper. Suppose that you’re hungry, and you want to get something to eat at a restaurant. You have some decisions to make. How quickly do you want or need a meal? How much time do you have? How much money do you want to spend? Are there types of food that you prefer? We make these types of decisions every minute of the day. So if you’re hungry, have 20 minutes and a limited amount of money, and want something familiar to eat, you might go to a fast-food restaurant, and your expectations probably will be met. In fact, you probably didn’t notice or even pay attention to any of the inner workings of the fast-food service provider. If the customer can find, order, receive, and be satisfied with the service – without incident – good service management is in place. But what if something weird happened? You walk into that fast-food restaurant, expecting to get the sandwich you always order quickly, but instead, a hostess greets you and informs you that the wait for a table will be 20 minutes. Lovely music is playing, and every table has a white tablecloth. Naturally, you’re confused. You start thinking about the inner workings of service management in that restaurant. What has gone wrong? Is someone not doing his job? Is some information about customer expectations missing? Is someone changing the expected outcomes without informing customers? You might even start trying to solve the problem by asking probing questions. In your confusion, you walk out of the restaurant and find somewhere else to get a sandwich. Why are we telling you this crazy story? When you’re thinking about service management (monitoring and optimizing a service to ensure that it meets the critical outcomes the customer values and stakeholders want to provide), many dimensions and aspects may not be apparent at the outset. 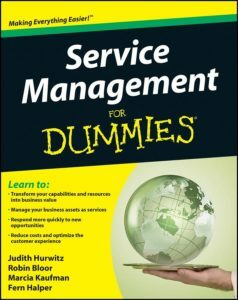 In this chapter, we give you a glimpse into the new world of service management. Clearly, effective service management requires an alignment of the overall business goals and objectives. This type of alignment isn’t a one-time task: An iterative cycle is involved, not only on a strategy level, but also within each stage of service management. Creating a valuable customer experience requires a lot of behind-the-scenes work that the customer never sees unless something goes wrong. As we show in the examples in this chapter, you can’t ignore one element of the overall service management process without affecting the way that the entire system works.